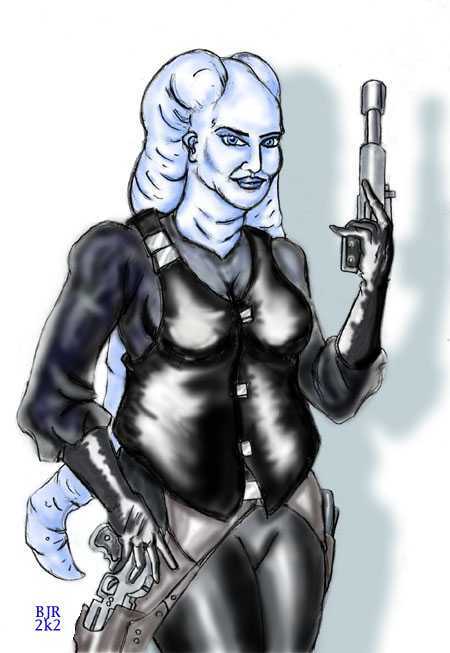 This was for a 'chubby' female twi'lek. The human (or near human) anatomy is always a challenge for the artist to depict correctly. The effect of weight, gravity and tension is something that is always being mastered and worked on. I loved doing this request, as it was a departure from the norm and would test my abilities. It wasn't for some fantastically-proportioned character that only exists on the covers of trashy fantasy novels. It was of a very realistic and deep character and was a pleasure to draw. In my opinion, this is what SWAG needs more of....well rounded realistic characters rather than a million requests for a cookie cutter jedi that looks like every other Jedi in the SW universe. Booooring.